This week’s theme is German food, children’s rain/outdoor wear, tools and organizers for the garage or other work space, bathroom accessories, and a few miscellaneous items. Deutsche Küche Bavarian Soft Pretzels or Pretzel Sticks, $3.49 for 17.57 oz. Sold frozen. Deutsche Küche Original Mini Brats, $3.79 for 11 oz. Deutsche Küche Pork Schnitzel, $7.99 for 24 oz. Sold frozen. Deutsche Küche Frozen Spaetzle, $2.69 for 10.9–12 oz. Assorted varieties available. Deutsche Küche Egg Spaetzle, $1.99 for 17.6 oz. 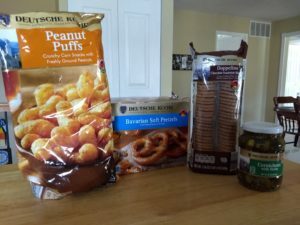 Deutsche Küche German Style Pickles, $2.49 for 24.3 oz. Deutsche Küche Spritz Cookies, $2.29 for 10.6 oz. Assorted varieties available. Deutsche Küche Doppel Keks, $2.29 for 17.6 oz. Deutsche Küche Doppelino, $2.99 for 17.6 oz. Available in Chocolate, Lemon, or Hazelnut. Deutsche Küche Jaffa Cakes, $2.29 for 10.6 oz. Available in Orange or Raspberry. Deutsche Küche Donauwelle or Bienenstich Indulgent Cake, $3.49 for 13.6–16.93 oz. Sold frozen. Deutsche Küche Imported Strudel, $2.49 for 19.2 oz. Sold frozen in assorted varieties. Deutsche Küche Spinach & Ricotta or Artichoke & Cheese Savory Strudels, $3.99 for 10.6 oz. Sold frozen. Lily & Dan Children’s Umbrella, $4.99. Features 36″ canopy diameter. Lily & Dan Children’s Spring Jacket, $9.99. Sizes 3T, XS–M. Lily & Dan Girls’ Rain Boots, $9.99. Sizes 5/6–2/3 in assorted prints. Lily & Dan Boys’ Rain Boots, $9.99. Sizes 7/8–2/3 in assorted prints. WORKZONE Foldable Hand Truck, $19.99. WORKZONE Connectable Moving Dolly, $16.99. Holds up to 330 lb. WORKZONE Foldable Sawhorse 2-Pack, $19.99. WORKZONE Rechargeable LED Worklight, $16.99. Rechargeable lithium-ion battery and charger included. WORKZONE 18″ x 30″ All-Purpose Mat, $5.99. Assorted styles and colors. WORKZONE 3′ x 4′ All-Purpose Mat, $14.99. Assorted styles and colors. WORKZONE 4-Step Aluminum Ladder, $34.99. Holds up to 250 lb. WORKZONE 24″ Multi-Surface or Rough Surface Heavy Duty Push Brooms, $9.99. WORKZONE Multi-Drawer Cabinet, $9.99. Choose 17-Drawer Cabinet or 33-Drawer Cabinet. Drawer separators included. WORKZONE 12V Lithium-Ion Cordless Drill, $24.99. WORKZONE 45-Piece Screwdriver Set with Storage Rack, $12.99. WORKZONE Household Assortment, $4.99. Choose a Nail, Hook, or Screw and Dowel assortment. WORKZONE 3-Pack Duct Tape, $7.99. Choose three Silver, or choose Silver, White, and Black. WORKZONE Trigger Clamps, $9.99. Choose a 4-Piece or 2-Piece Set. WORKZONE Work Insoles, $4.99. Fits Men’s Sizes 8–13; Ladies’ Sizes 6–10. WORKZONE 5-Pack Nitrile or 3-Pack Latex Coated Gloves, $3.99. Easy Home Multifunction 2-in-1 Showerhead Kit, $19.99. Includes 6-Function Handheld and 6-Function Wall Mount Showerhead. Showerheads spray separately or simultaneously. Huntington Home PEVA Shower Curtain Liner, $5.99. Assorted colors. Huntington Home 2-Piece Bath Rug Set, $9.99. Assorted colors. Easy Home Suction Bath Assortment, $4.99. SOHL Furniture Wooden Space Saver, $49.99. Features 30-lb. weight capacity per shelf. Measures 25.98″ L x 10.04″ W x 61.02″ H.
SOHL Furniture Wooden Wall Cabinet, $34.99. Adjustable shelves. Measures 21″ L x 8.5″ W x 25″ H.
Easy Home Wooden Vanity Organizer Set, $9.99. Magnetic side holds small metallic accessories. Assorted varieties. Easy Home Interlocking Organizers, $9.99. This is a three-piece set. Easy Home 3-Tier Bathroom Cart, $14.99. Each shelf holds up to 10 lb. Available in Satin Nickel or Oil-Rubbed Bronze. Easy Home 4-Piece Bath Hardware Set, $14.99. Includes mounting hardware. Available in Satin Nickel or Oil-Rubbed Bronze. Easy Home Toilet Seat with Easy Close & Quick Release, $14.99. Easy Home Flexible Tote, $3.49. Assorted colors. Sempre Men’s or Ladies’ Watches, $8.99. Genuine Leather or Metal bands. Huntington Home 3-Wick Candle, $3.99. Soy blend scented candles are 4.5 oz. USDA Choice Beef Pot Roast Kit, $8.99 for 2.75 lbs. Fresh Steelhead Trout, $9.99 per lb. A good choice for Lent. Great Range Bison Fresh Ground Bison, $7.99 per lb. Read our review of Aldi’s ground bison here. Deutsche Kuche, Easy Home, Great Range, Huntington Home, Landshut, Lily & Dan, Sempre, SOHL Furniture, WORKZONE. Bookmark.